Paya-Paya Villa blends into seamlessly into the contours of a landscape that descends down to a riverbed. Access via a series of steps reveals an open environment with a generous swimming pool and Jacuzzi edged by a garden of native greenery. In a corner by the entrance, there is a modern interpretation of a Balinese lounging pavilion with a flat roof top that provides extra deck space to soak up the sun. 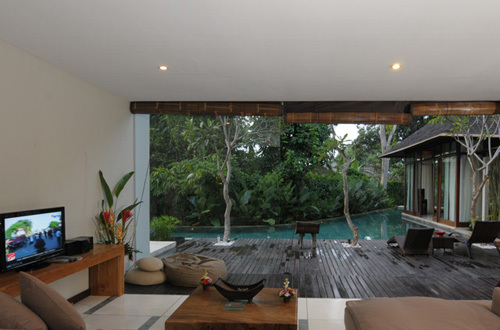 Architecturally, the split level Paya-Paya Villa is composed of two structures. The open-plan living and dining area on the ground floor is orientated towards the pool and exposed to the elements of nature. A gourmet kitchen is equipped with all necessary utensils and tableware for in-villa meal preparation or entertaining an intimate gathering of friends. A covered walkway leads to the master bedroom that has been designed for personal time out with direct access into the pool. There is also a private deck and spa-styled en-suite bathroom with sunken tub and rain shower for the ultimate in bathing indulgence. Two additional bedrooms are located off a corridor upstairs where an entire wall of timber slats allows optimal air circulation yet cocoon the villa from the street below. Each bedroom features a minimalist décor and sleek bathroom facility. Gracious hospitality from the heart. Paya-Paya Villa is staffed by an efficient in-house team that is on hand to handle all daily duties. Additionally, an around the clock security service ensures complete peace of mind. Guests needs at Paya-Paya Villa are suitably addressed with a range of personalised services and facilities to enrich the quality of each and every stay. * 3 Air-Conditioned Bedrooms (sleeps up to 6 adults). * Television with Satellite Channels & Home Entertainment System. * Chilled Towel & Welcome Drink. * Daily Breakfast (on request). * Tour & Travel Arrangements (on request). * Private Chef (on request). * Romantic Dinner (on request). * Spa & Beauty Rituals (on request). Please note that daily breakfast based on villa occupancy is not included in the rate. However, this service can be provided on request for an additional fee. - Welcome drink and cold towel upon arrival. - Fruit basket on arrival. - High season : July 15 - 31 and September 01 - 15. - Peak season : August 1 - 31 and December 20 - January 10.